Is there a better alternative to ImageBuffet? Is ImageBuffet really the best app in Photography category? Will ImageBuffet work good on macOS 10.13.4? ImageBuffet needs a review. Be the first to review this app and get the discussion started! ImageBuffet needs a rating. Be the first to rate this app and get the discussion started! ImageBuffet is a simple, efficient, and intuitive image viewer and browser. If you've found Preview to be lacking, this is the image viewer for you. ImageBuffet really shines when viewing folders full of images. Simply drag a folder or folders full of images onto ImageBuffet to very quickly browse through them. It can also find all the images in your Pictures folder with a single click. ImageBuffet can easily handle thousands of images at once. You can very easily assign Finder labels to image files, copy them, or move them to the trash. You can also easily import images into iPhoto, share them via various social networks, or view them as a slide show. ImageBuffet has extensive keyboard shortcuts, and supports many gestures with a trackpad or Magic Mouse. 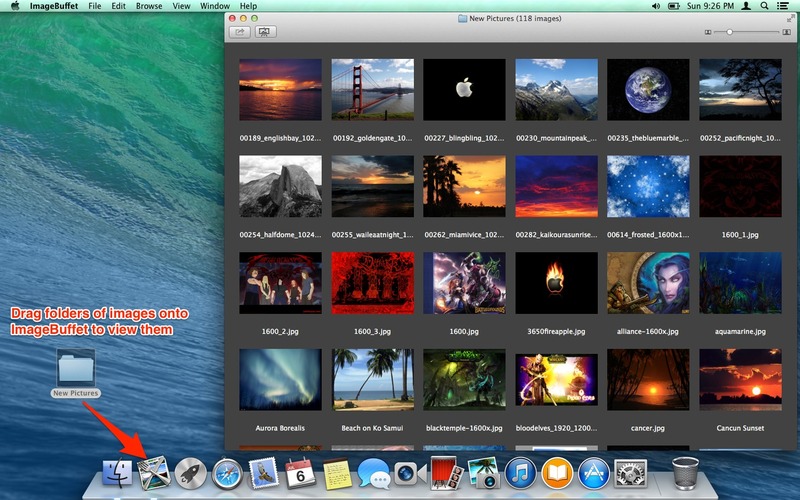 Quickly browse thousands of image thumbnails with the image browser view. View all images in your iPhoto library. Zoom any image to actual size, to fit the window, or to any arbitrary size. Easily share images via email, Messages, AirDrop, and various social networks. View a slide show from any number of images. Supports many image formats including PNG, JPEG, GIF (including animated), TIFF, various RAW formats, and others. If Preview.app can open it, so can ImageBuffet. Looks fantastic with a Retina display.